Little Gunnar’s Blue Tuesdays presenterar stolt: DEKULA BAND! It’s rumba time ladies and gents! Dekula & His Band which is based in Stockholm Sweden, plays Soukous music which is largely popular in East and Central Africa. 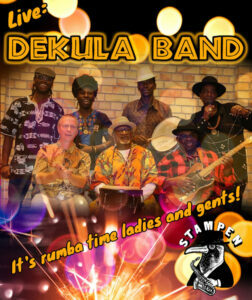 Dekula Band have set up base at Little Nairobi in Stockholm where the band continues to entertain fans on week-ends. Maestro Dekula also does many music errands across Sweden and remains one of the most popular musicians within the African community in Sweden. Glöm den gråa vardagen. Dekula Band bjuder på en fest av rang! Dansa, dansa, dansa och släck törsten med en kall emellanåt!